Sheldon Brown passed away recently. I'm not sure how to explain how this effects me. 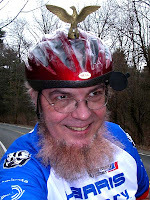 I never met him, but had some interactions with him on BikeForums.net. His website (Link on the left) helped make cycling what it is to me. When I first got into cycling as an adult, I went to his site many, many times for advise and information (I still do). It took some of the mystery out of it, and some of what I do is based on concepts learned from him. Your work will be continued by the many people whose lives you touched. There are many more. He was very prolific and helpful. And will be missed by anyone whose life he touched, either directly or indirectly. Whenever someone loses a mentor, a dear friend or just someone who helped them to think, rethink, or feel something about ANY given thing or situation it can be tough. My hero's change over the years, some come, some go, but they all still have a profound impact on my life at the time. They just have to speak to me on some level and a lot of my heros' wouldnt even be looked at as "positive" I guess you could say. Right now and it has been that way for quite a while now, my hero is a man in his mid 40s who is a serious recovering addict. He reminds me that we could be one sip, snort and/or shot away from being in the same shape he was in for so long. He also reminds me of the beauty of life once that fog clears and you can begin to see clearly again.